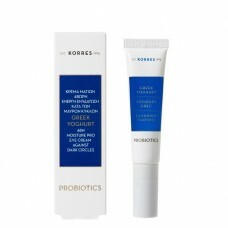 An instant cooling eye cream that moisturises, nourishes and primes the eye area before makeup application. This advanced nourishing eye cream is formulated with Yoghurt, a centuries-old Greek skin soothing solution, and myrtle and rhodiola rosea extracts to reduce the appearance of dark circles, fine lines and puffiness. The cooling treatment perfectly primes the delicate eye area for flawless concealer application and is ideal for sensitive eyes prone to allergies. The ceramic cooling tip gently massages eyes with each application, giving eyes a refreshed and rested look.